Hypofunction of the NMDAR together with dysregulated dopaminergic transmission is thought to contribute to the pathophysiology of schizophrenia. Enhanced the NMDAR function to ameliorate negative symptoms by Glycine transporter inhibitor (GTI) is a predicted pharmacological therapeutic strategy for the management of schizophrenia. In recent clinical studies – Bitopertin (RG1789) phaseIII and AMG747, they doesn’t appear a good expectation for the therapeutic theory. 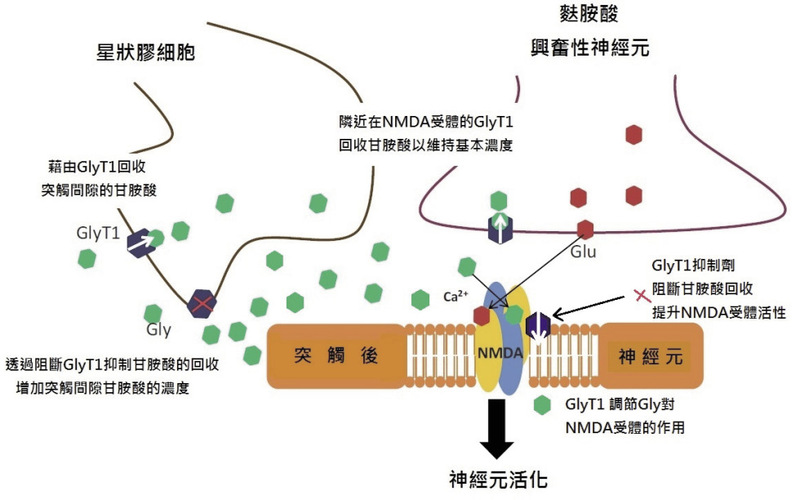 In paper, we introduce the NMDAR and mechanism of GTI that how to enhance NMDAR function and discuss the unexceptional result of clinical studies to reason - NMDAR down regulation. The GTI may be used to ameliorate negative syndrome for a subchronic use despite little evidence to apply in long term therapy. We are look forward to therapeutic results of GTI in other CNS disease. 1.Gary Remington, George Foussias, Gagan Fervaha, et al: Treating Negative Symptoms in Schizophrenia: an Update. Curr Treat Options Psych (2016) 3:133-150. 3. Christopher LC, Peter RG: Inhibitors of Glycine Transporter-1: Potential Therapeutics for the Treatment of CNS Disorders. Current Topics in Medicinal Chemistry Volume 16 , Issue 29 , 2016. 4. 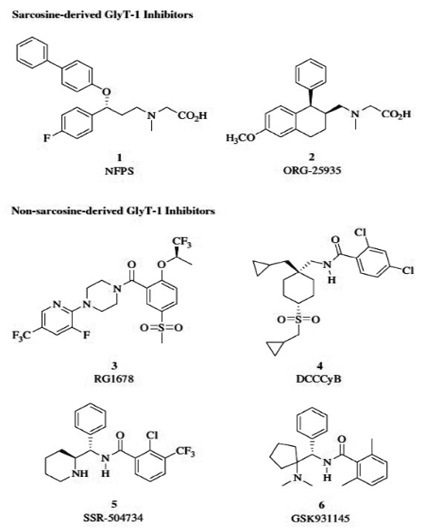 Christopher LC, Mark AW, Peter R G, et al: Design, synthesis, and SAR of N-((1-(4-(propylsulfonyl)piperazin-1-yl)cycloalkyl)methyl)benzamide inhibitors of glycine transporter-1. Bioorganic & Medicinal Chemistry Letters 23 (2013) 1257-1261. 5. 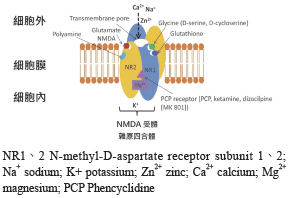 Tsai G, Lane HY, Yang P, et al: Glycine transporter I inhibitor, N-methylglycine (sarcosine), added to antipsychotics for the treatment of schizophrenia. Biol Psychiatry 2004; 55: 452-6. 6. Lane HY, Liu YC, Huang CL, et al: Sarcosine (N-methylglycine) treatment for acute schizophrenia: a randomized, double-blind study. Biol Psychiatry 2008; 63: 9-12. 7. Lane HY, Lin CH, Huang YJ, et al: A randomized, double-blind, placebo-controlled comparison study of sarcosine (Nmethylglycine) and D-serine add-on treatment for schizophrenia. Int J Neuropsychopharmacol 2010; 13: 451-60. 8. Dominik S, Micha, Olga K, et al: Supplementation of antipsychotic treatment with sarcosine - GlyT1inhibitor - causes changes of glutamatergic 1NMR spectroscopy parameters in the left hippocampus in patients with stable schizophrenia. Neuroscience Letters 606 (2015) 7-12. 9. Buchanan RW, Javitt DC, Marder SR, et al: The cognitive and negative symptoms in schizophrenia trial (CONSIST): The efficacy of glutamatergic agents for negative symptoms and cognitive impairments. Am J Psychiatry 2007; 164: 1593-602. 10. Ouellet D, Sutherland S, Wang T, et al: First-time-in-human study with GSK1018921, a selective GlyT1 inhibitor: relationship between exposure and dizziness. Clin Pharmacol Ther 2011; 90: 597- 604. 11. D&apos;Souza DC, Singh N, Elander J, et al: Glycine transporter inhibitor attenuates the psychotomimetic effects of ketamine in healthy males: preliminary evidence. Neuropsychopharmacology 2012; 37:1036-46. 12. Schoemaker JH, Jansen WT, Schipper J, et al: The Selective Glycine Uptake Inhibitor Org 25935 as an Adjunctive Treatment to Atypical Antipsychotics in Predominant Persistent Negative Symptoms of Schizophrenia: Results From the GIANT Trial. Journal of Clinical Psychopharmacology: April 2014 - Volume 34 - Issue 2 - p 190-198. 13. Umbricht D, Martin-Facklam M, Pizzagalli E, et al: Glycine transporter type 1 (GLYT1) inhibition RG1678: Results of the proof-of concept study for the treatment of negative symptoms in schizophrenia. Schiz Bull 2011; 37(1): 324. 15. 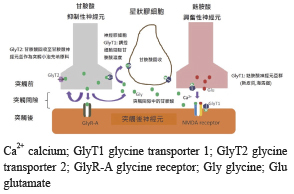 Eduardo D, Robert WB, Chao-Yin C, et al: Efficacy and safety of the glycine transporter type-1 inhibitor AMG 747 for the treatment of negative symptoms associated with schizophrenia. Schizophrenia Research 182 (2017) 90-97.